Gaza Erupts! At Least 15 Are Dead in Factional Fighting! Bombs and gunfire claim over 15 lives in factional fighting! Battles are raging tonight as Hamas and Fatah members are bombing, shooting and storming homes in Gaza! Rival Palestinian factions clashed in the Gaza Strip on Friday, killing 15 people including a two-year-old child, and a Fatah-linked group said it had captured 24 Hamas hostages. The death toll in a wave of bombings and shootings is the highest in internal Palestinian fighting in a single day of violence since Hamas’s rise to power exactly a year ago. In Jabalya in the northern Gaza Strip, Hamas gunmen besieged and later stormed the house of senior Fatah militant Mansour Shalayel, who they accused of shooting a Hamas supporter. Security forces said they managed to regain control of the house and drive away the attackers and free Shalayel and other people who were holed up inside the house unharmed. 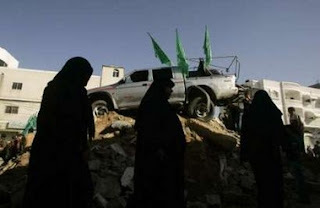 Hamas disputed Fatah’s claim of success and said they were in control of the house. Shalayel had not been seen late on Friday and his whereabouts or condition were not known. 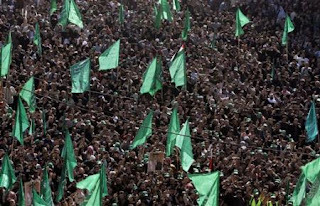 Just hours earlier Hamas supporters were celebrating there 2006 election win with a massive ceremony in Gaza.